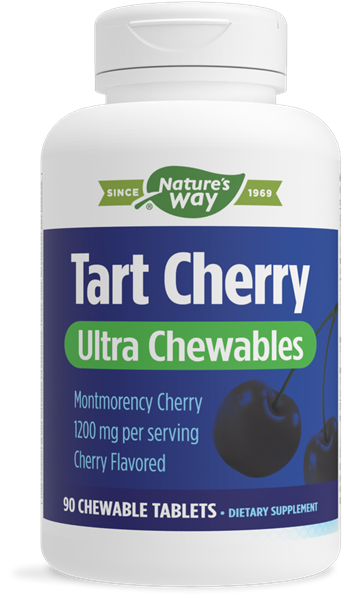 Tart Cherry Ultra Chewable / 90 Chew Tabs - Nature's Way®. Contains beneficial flavonoid compounds which give tart cherries their bright red color. Why use Tart Cherry Ultra Chewables? Take 3 chewable tablets daily. If pregnant, nursing or taking any medications, consult a healthcare professional before use. Why has the Tart Cherry Ultra label been updated? We have been unable to continue to source the same tart cherry skin concentrate raw material at the standardization level we require, so we have updated the label claims and Supplement Facts Box to reflect those changes. As always, we continue to strive to provide the absolute best Tart Cherry Ultra product possible with available raw material. The label change affects both the capsule and the chewable Tart Cherry Ultra SKUs. Is the source of tart cherries in Tart Cherry Ultra Montmorency? Yes, while some tart cherry products use a mix of various varieties of tart cherries (Prunus cerasus), Tart Cherry Ultra vegetable capsules and chewable tablets use a concentrate derived from only the Montmorency variety of tart cherry (Prunus cerasus).